When it comes to rigging up a portable sketch kit, Velcro is the key*. After devising a tiny paint box made from a Trader Joe’s mint tin and Daniel Smith watercolor sticks, I had to resolve the issue of juggling the paint box, mixing palette and sketchbook when sketching while standing up. Here’s my solution. Velcro attached to tin and name plate. I attached a small strip of industrial-strength Velcro to the bottom of the paint box (unfortunately, this means I had to remove the color swatch card, which I found a place for in a sketchbook). The mixing tray has gone through several renditions, each better than the previous one. 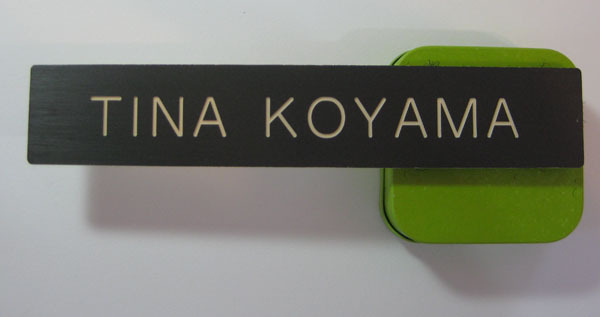 Currently it is the detached lid from my old Sakura Koi watercolor box. 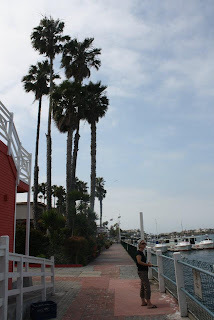 See the previous renditions in this blog post. Now comes the best part: The whole assembly attaches directly to the sketchbook with a binder clip, which secures the other end of the name plate to the sketchbook cover. 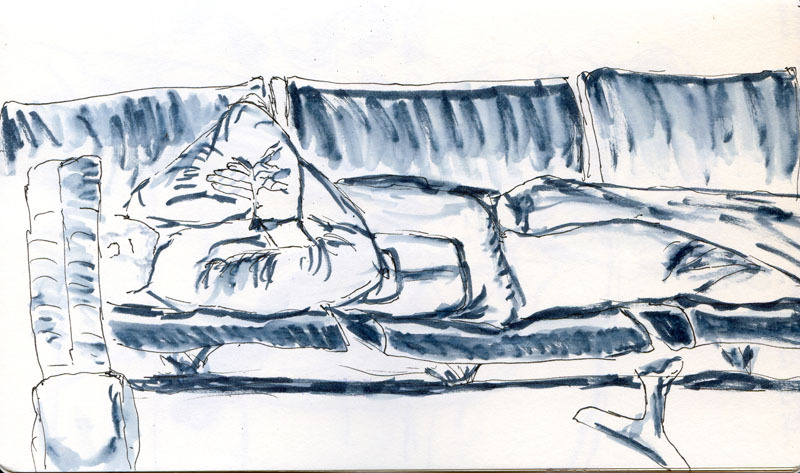 The solution works equally well with my pocket-sized Moleskine, 5” x 8” Moleskine and 5 1/2” x 8 1/2” Stillman & Birn. My right hand holds only the sketchbook, and my left is free to paint! ﻿﻿﻿﻿﻿﻿﻿I’m pleased that all of this came together in a very short time. The most time-consuming part about the entire project was removing all the gummy adhesive residue on the mint tin and the back of the name plate with lighter fluid. 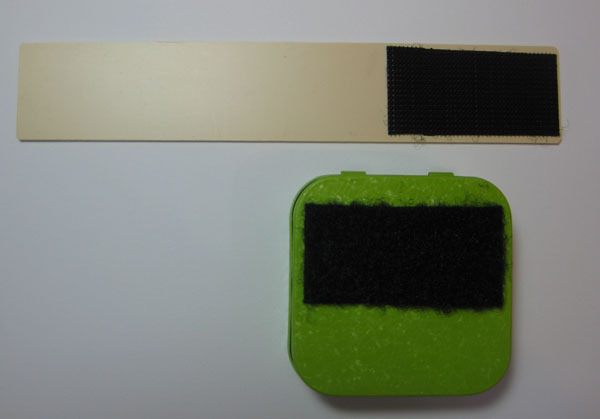 *Everything I know about Velcro as a critical sketch kit assembly tool I learned from Jamie Williams Grossman’s incredibly informative and inspiring blog, as well as various discussions on Wet Canvas and the Sketching Forum. Thank you, all, for your great ideas! 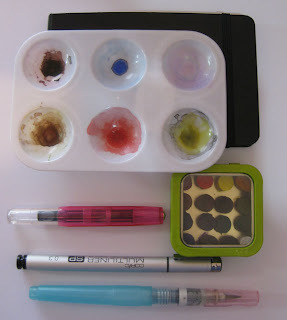 See the update to my portable watercolor kit. The Internet art world is full of amazingly creative artists, not only in the art they create, but also in the ways they modify tools or repurpose materials to suit their needs. 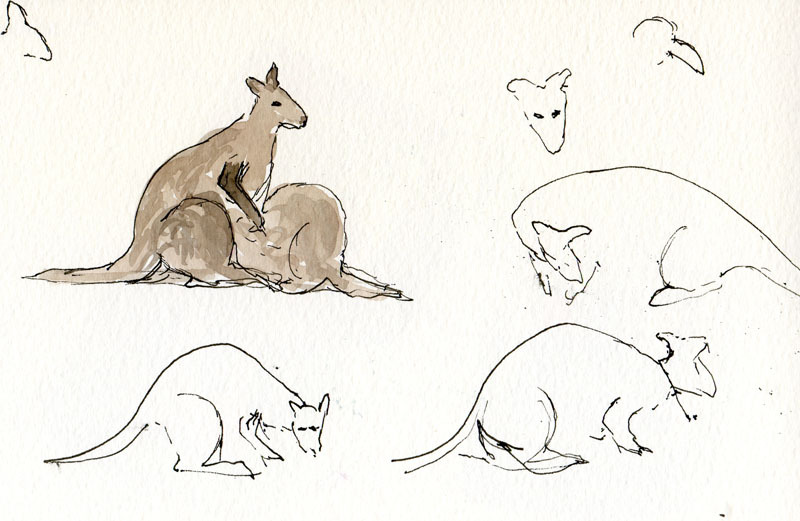 I am especially inspired and impressed by sketch kits I see – the smaller and more portable, the better. Some of the best ideas are on a ridiculously long-running thread on the Wet Canvas forum, on Russ Stutler’s highly informative Book About Sketching, and on an impromptu thread that recently grew on the Sketching Forum. 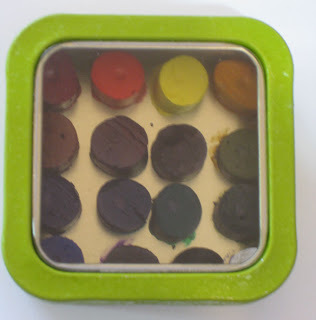 In fact, devising a watercolor paint box that contains the greatest number of colors in the tiniest space possible is practically a competitive sport. Not to be outdone, I decided it was time to come up with my own. Not that competitiveness was the primary motive. 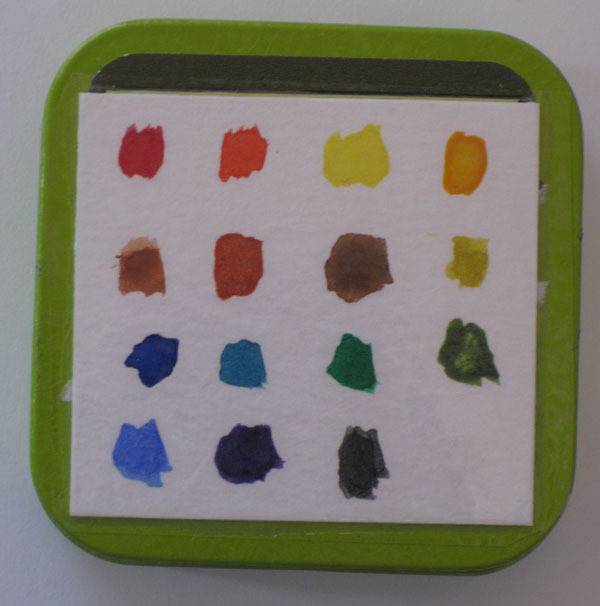 Up until now, I have been mostly happy with my off-the-shelf Sakura Koi watercolor box with its 24 colors and convenient, built-in mixing wells. But the box itself, measuring 6” x 4.5” x 1”, can get heavy and somewhat cumbersome when trying to paint while standing. So I was interested in making a smaller, lighter box. That was the motivation. But the inspiration for my box was attending a recent demo of Daniel Smith watercolor sticks by Seattle-area artist Che Lopez (seen in these video demos). Che had a Winsor & Newton Bijou box that he had filled with cut-up chunks of watercolor sticks instead of traditional watercolor pans. 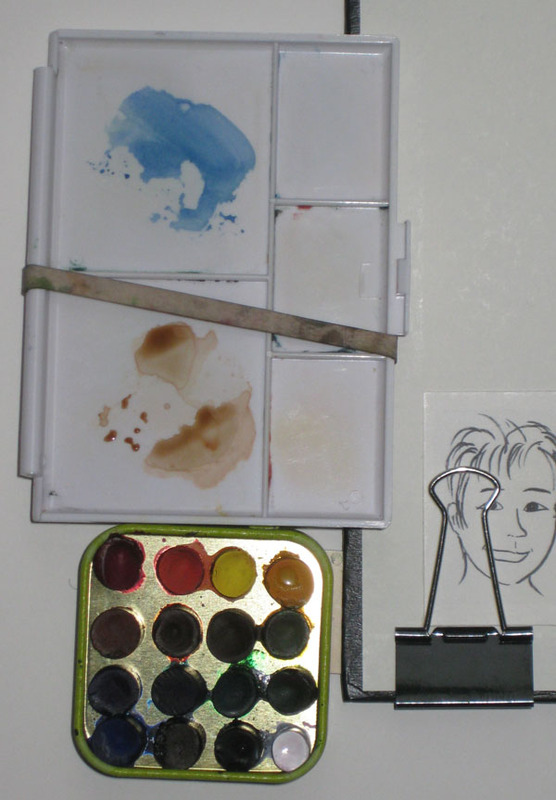 Since I had not yet acquired much of a collection of either pans, tube paints, sticks or anything else that might go into a watercolor box, I was starting with a fresh palette, so to speak. Why not sticks? 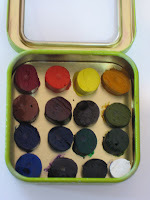 I knew instantly which box would house my paints: Trader Joe’s Green Tea Mints are my spouse-man Greg’s favorite, and I am fond of the bright green tin with a clear plastic window that the mints come in, so I had saved several. The tin measures 2¼” x 2¼” x ¾”, so it is appealingly small and light. The paint box came together in a very short time. I used a utility knife to cut off quarter-inch stubs from the sticks. With a brush, I dabbed a somewhat generous drop of water onto one end, and smushed the stub down firmly into the box bottom. Once the water dried completely, the stubs were firmly attached. I was able to get 16 colors to fit. I’ve been carrying the box around in my purse all week, and the colors haven’t popped off yet. Bare-essentials sketch kit for the proverbial desert island. Shown here is my bare essentials, stuck-on-a-desert-island-with-both-size-and-weight-restrictions sketch kit: A pocket size Moleskine sketchbook, mixing well, Daniel Smith watercolor sticks paint box, Kaweco Sport fountain pen, Copic Multiliner SP pen (0.30) and Kuretake waterbrush. Actually, the fountain pen is probably a second-tier item, but since it’s so small, I threw it in. Everything shown fits easily into my Nomadic pencil case with plenty of room to spare for second-tier items such as Akashiya and Tombow markers, more sizes of waterbrushes and water-soluble pencils. Everything shown also fits into two large pockets of my sketch vest. Color swatches on the bottom of the tin. On the day of the solstice, it actually felt like summer, and the animals at the zoo seemed to appreciate the sunshine as much as we did. More animals than usual were out and about, running and grazing, just like we were. Unfortunately, their activity meant I could capture fewer of them with my sketchbook. It was fun to watch them nonetheless. 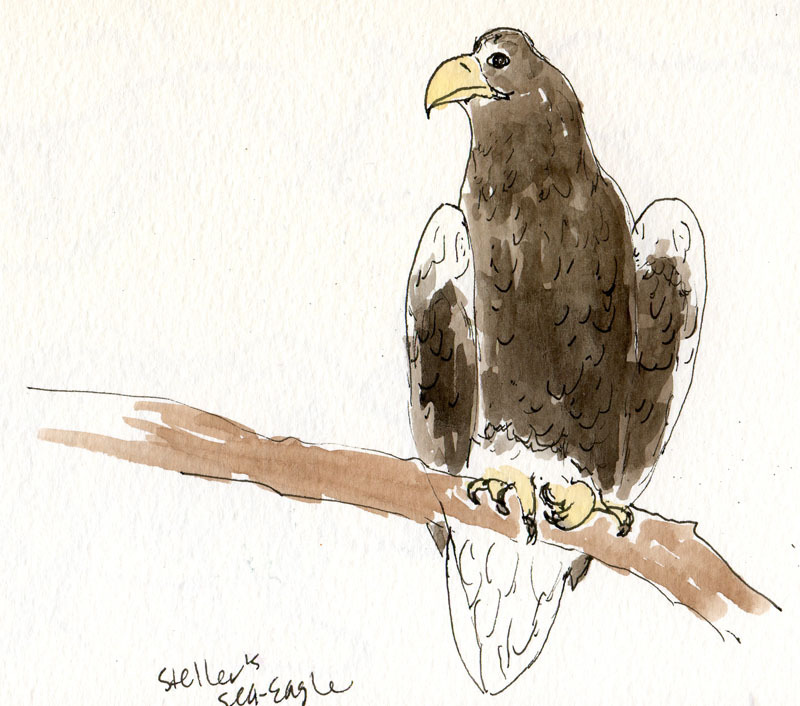 Unlike the wallaby nursing her joey, whom I could see only from a distance, this Steller’s sea-eagle posed for me up close and personal for many minutes. Everything I’ve ever read or heard about improving one’s photos includes this advice: Move in close and fill the frame with the subject. It turns out that this advice is worth heeding when sketching, too. On a sunny afternoon, the playground at Green Lake was a popular place for the stroller set. 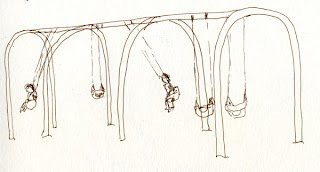 I started sketching a swing set that proved to be a miserable challenge – difficult perspective, both parents and kids moving too quickly, lots of action but no focal point. 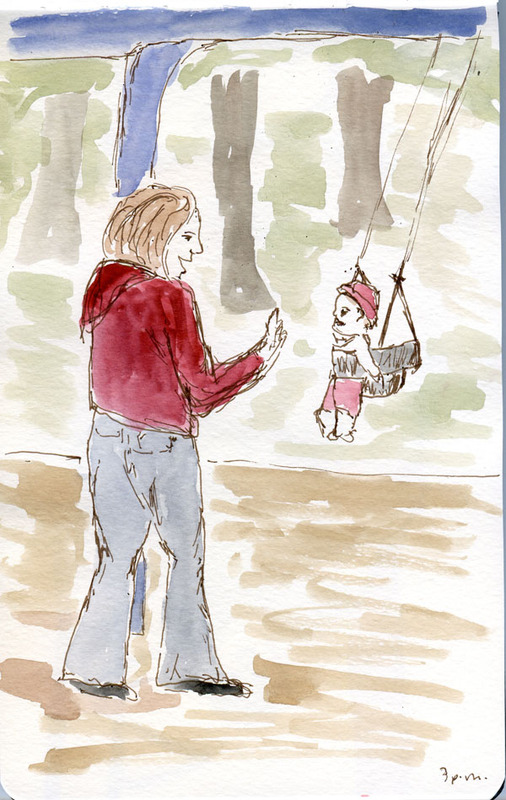 While seated on the same bench, I “zoomed in” closer with my eyes to pick out one toddler with her mom. I’m not sure if the sketch is any better, but at least the composition is. 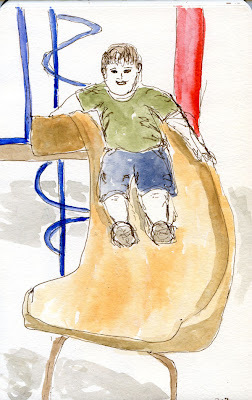 I zoomed in on the boy on the slide too, but he posed an additional challenge. Unlike adults in coffee shops working on their laptops, kids never stay still (a startling discovery!). I used the same strategy I learned from trying to sketch a restless bear at the zoo: Sooner or later, the pacing animal will reappear in the same location with the same gesture, probably many times. 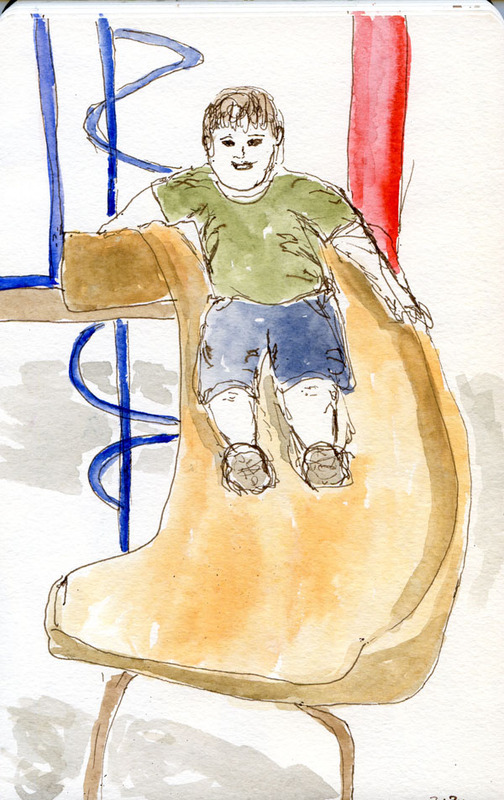 So the first time the boy sat at the top of the slide, I caught the position of his head and shoulders. He was having a great time, so I knew he’d reappear. The second time down, I managed to get his torso. And so on, until I finished the sketch. 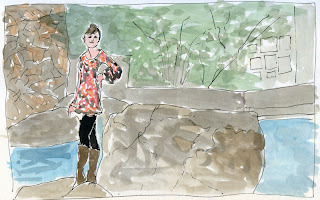 The Seattle Urban Sketchers met at the Seattle Center for a sketchcrawl of a Habitat for Humanity site. Called House of the Immediate Future and World House, the structures being built there are intended to raise awareness of Habitat for Humanity during the Center’s Next 50 celebration. The construction site – stacks of lumber, bare studs, lots of parallel lines and perspective challenges – was overwhelming, and I didn’t know where to begin. 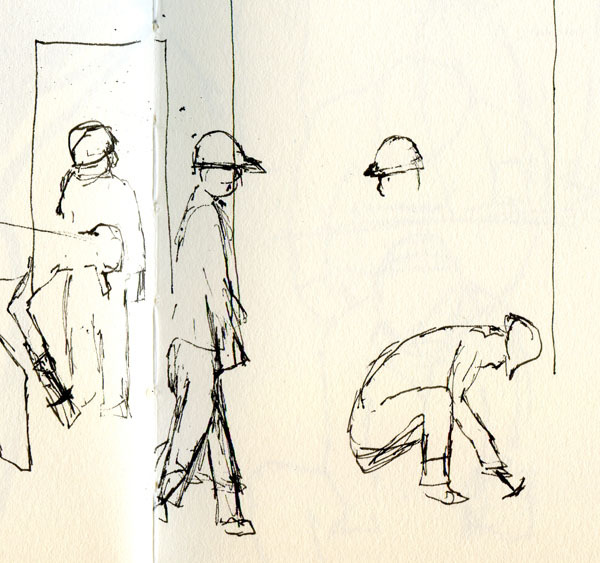 So I took the easy way out and warmed up with several gesture studies of some of the volunteer workers. Eventually I moved to a different location and spotted a bright yellow forklift, but I thought the composition needed a human or two. Munching a protein bar for lunch, I pondered the composition a while. 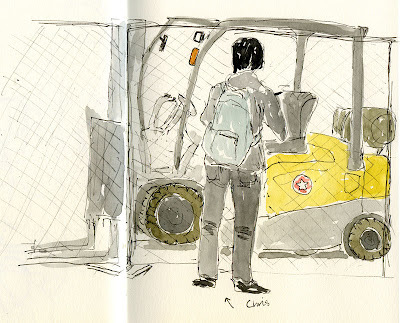 Cue fellow sketcher Chris, who stopped to sketch the forklift himself. He was exactly what I needed to give the heavy equipment a sense of scale. I sketched Chris first, knowing that he would probably wander away soon, which he did, and I finished the sketch in time to join the others for show and tell. 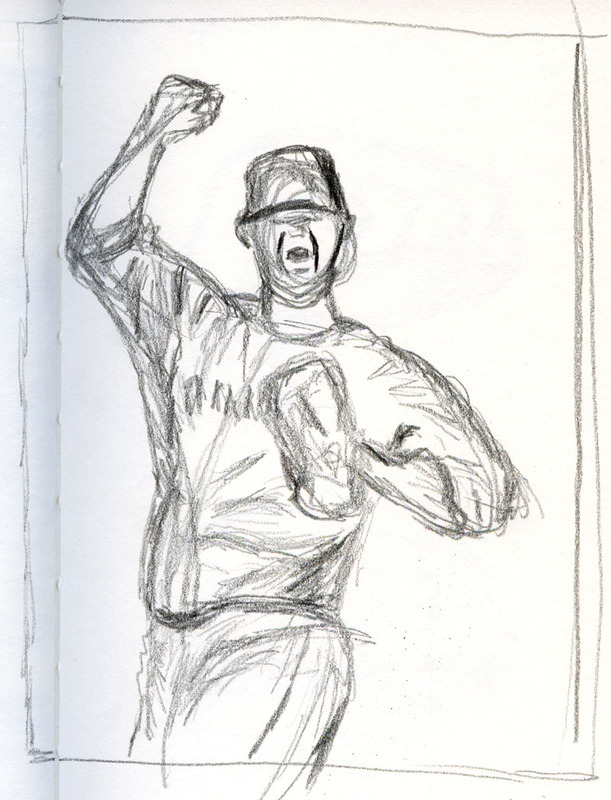 When I asked Chandler (instructor of the figure drawing class I took last weekend) how I might practice sketching at home without a model, she suggested using photos from the sports section of the newspaper, and I realized immediately what a great idea that is. I have no interest in sports, but as I routinely chuck the unopened sports section into the recycle bin, I am often stopped by the dramatic action photos I see published on the first page. So I retrieved yesterday’s sports section from the bin and found this ball player’s image, which made a useful gesture study. For some female figures to practice, I continued rummaging through the recycle bin and found a TravelSmith catalog with plenty of swimsuit and lingerie photos to choose from. Shading the negative space formed by the model’s arm helped me to position the arm’s angle correctly. Using different colored markers was useful in restating lines. 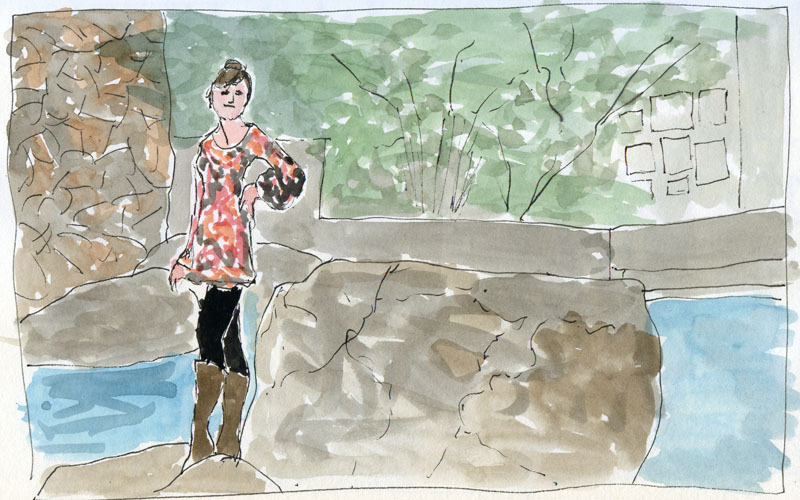 Our last session of Jane Richlovsky’s “Drawing on Location” class was spent at the Seattle Center with a model dressed in ‘60s clothes to match the mood of Century 21’s 50th anniversary. The format of the sketchbook I brought that day wouldn’t allow me to get both the model and the full Space Needle in the same sketch, but at least I got the fountain. 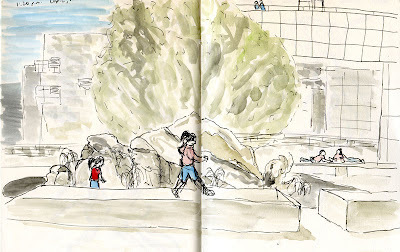 Jane suggested I try using her white pencil, which acted as a resist to the watercolor, to indicate the fountain water. If You Don’t Like the Weather, Just Wait. . . Heading toward the zoo on a sunny Friday afternoon, the top down on my Miata, I suddenly remembered that it was June, and that meant the Phinney Farmer’s Market was now open. Making a quick change of plans, I wandered through this friendly neighborhood market to sniff the pizza and flowers and scope out a location where I could sketch. Directly across from a flower vendor, I found the ledge of a raised planting bed that was ideal for sketching. I was having so much fun that I hardly noticed how dark the sky was growing until the shadows I was planning to paint disappeared. A woman sitting next to me on the ledge smiled at my sketch and said, “You’d better hurry and finish painting before it rains,” pointing to the dark clouds. I made a few quick purchases, still holding my sketchbook open to dry, and got the top up on my car just before the drops started to fall. 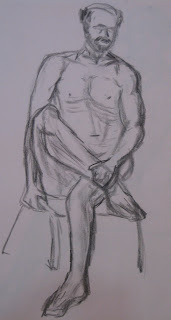 I spent an intensive weekend learning figure drawing from Chandler Woodfin at Pratt. By the end of each full day of trying to find the “gesture” in a live model, I came home exhausted, but I think I learned more about drawing the past two days than I ever have. 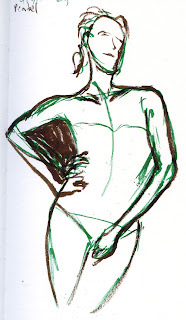 In a nutshell, locating the “gesture,” and therefore the expression, of a figure is all about the position of the shoulders and hips. If the gesture is correct, then the proportions will be correct. Much easier said than done! Nonetheless, after 39 drawings, I was surprised and pleased by my own progress. How did I know she was going to say that? While the rest of my party continued to chat and digest the luscious buffet brunch (including chocolate fountain!) 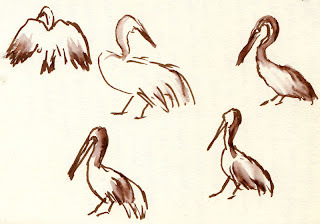 at Shanghai Red’s Marina Del Rey restaurant, I slipped away for some quick sketching. 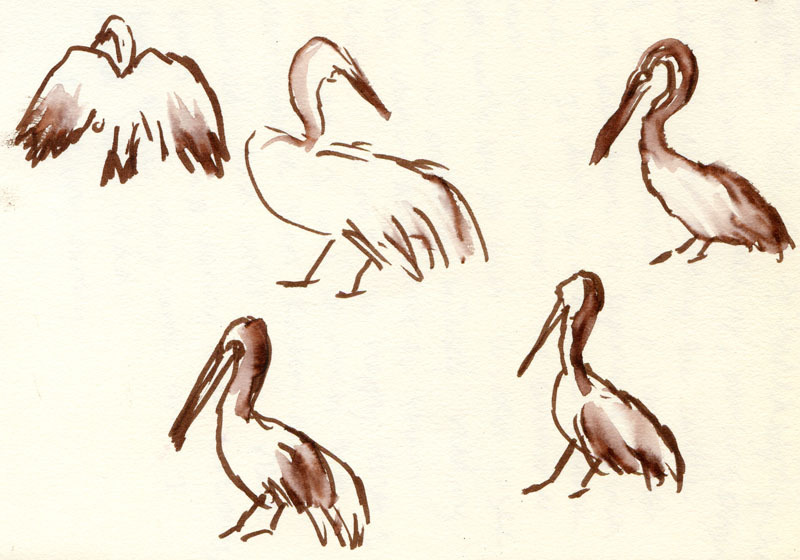 Along with gulls, a number of more unusual birds hung out at this marina, including lots of pelicans and some smaller, white, long-legged birds that resemble sandpipers. Later I discovered that Monica had also slipped away from the brunch to photograph the marina (and me sketching). 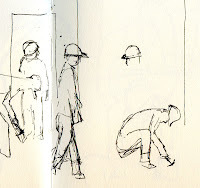 The past few weeks I’ve been taking Jane Richlovsky’s “Drawing on Location” class through Pratt. 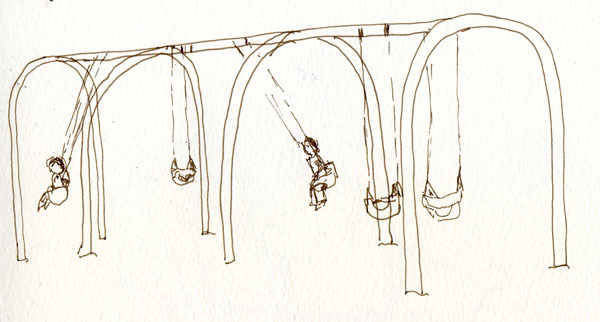 Each week we meet at a different location to focus on a particular sketching challenge. 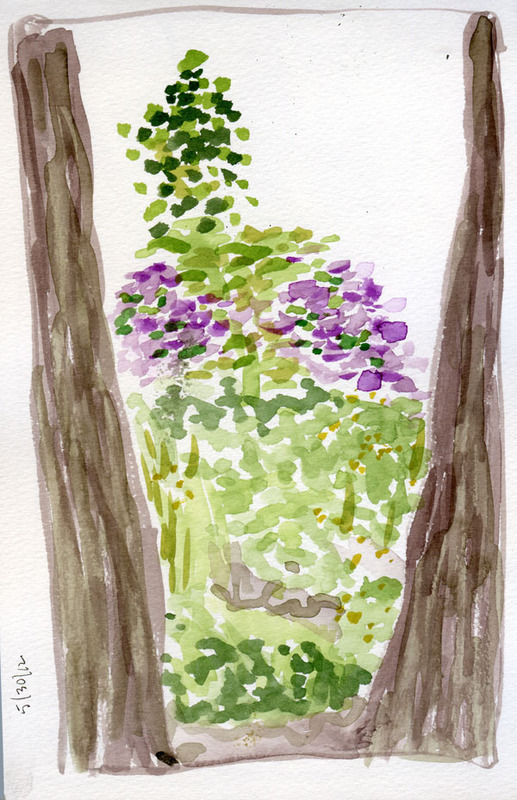 Last week it was trees (definitely one of the most challenging sketching subjects), at right, at the arboretum. 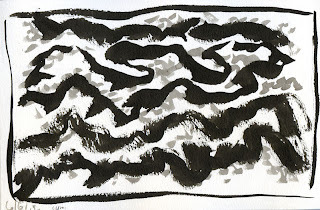 Yesterday it was water at the Ballard Locks, where I tried to capture the texture of water’s surface with sumi ink (below). 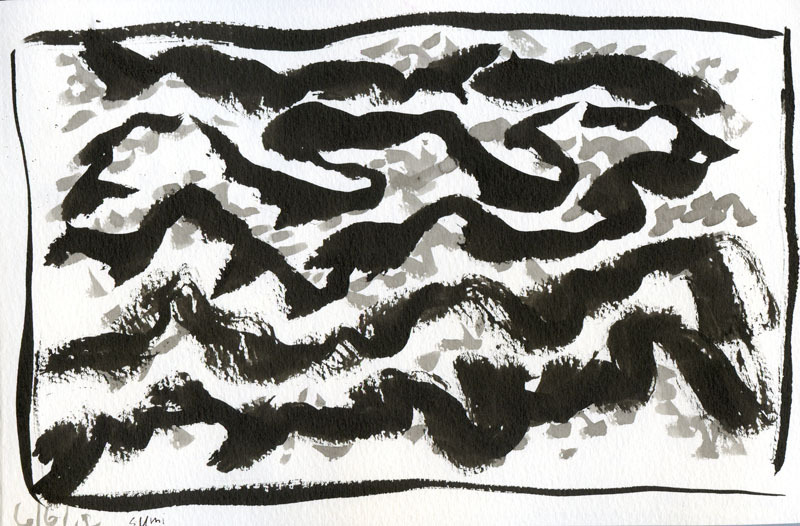 But as the class sketched various scenes of water, I was also captivated by ever-changing clouds. With Jane’s help, I gave this equally challenging subject a shot with watercolors (left). The narrow, vertical format enabled me to sketch a slim slice of sky, land and water, which was much less overwhelming than the typical horizontal landscape. This is Gerry, one of my new family members (as a result of the wedding that took place in L.A. last weekend). 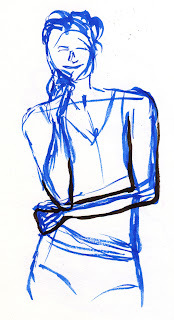 The house full of people, everyone engaged in various conversations, I quietly pulled out my sketchbook. He looked engrossed in his conversation, so I hoped he wouldn’t notice me. 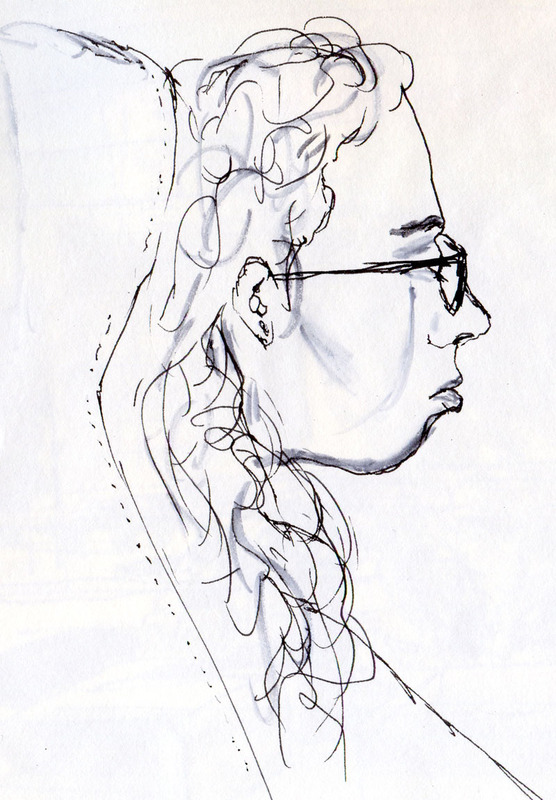 I’ve gotten pretty good at sketching strangers in coffee shops, but this was the first time I boldly sketched someone I knew, sitting only a few feet away. 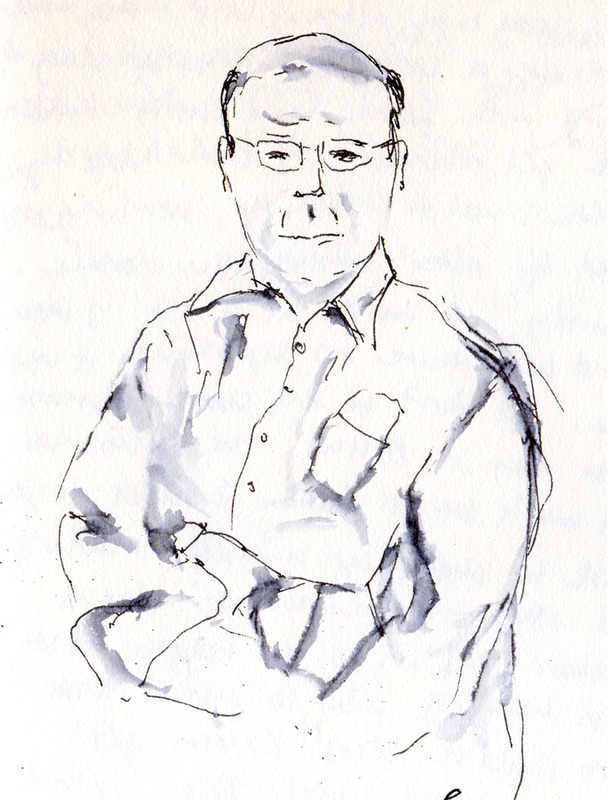 I was too shy to show the sketch to him at the time, but he saw it the next day and (kindly) said he saw a resemblance. 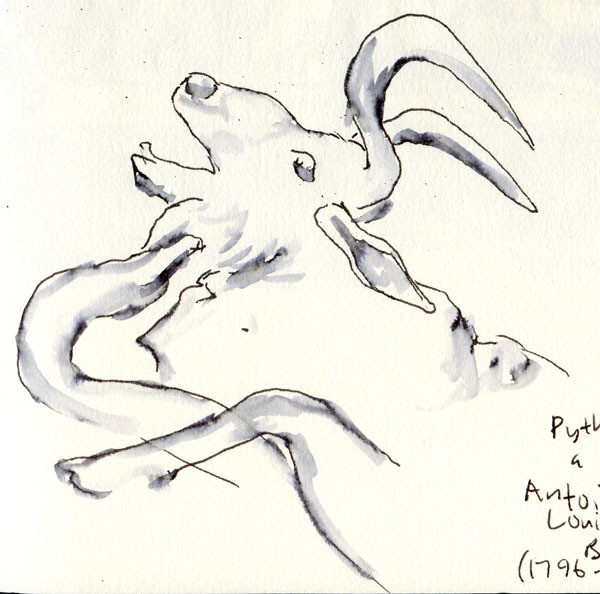 The sketch at right shows a detail of a sculpture called Python Killing a Gnu by Antoine-Louis Barge (1796 – 1875). 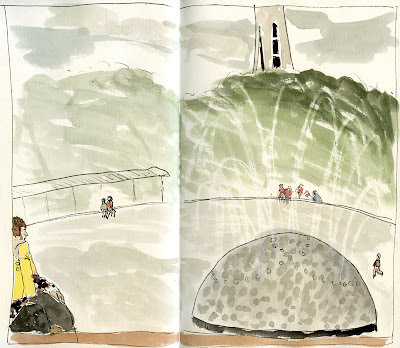 Sharing a table with a museum guard on his lunch break, I stopped at a sculptural fountain for a sketch (below) and some beautiful SoCal sunshine (the June Gloom had burned off by then). 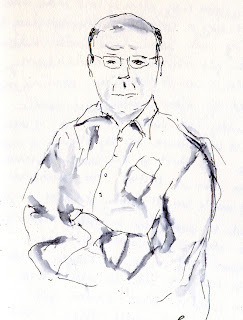 After finishing his sandwich, the guard pulled out a sketchbook, too. If I worked there, I’d probably spend all my lunch breaks that way. I’m looking forward to quite a bit of travel this summer and plenty of sketching opportunities that travel brings. 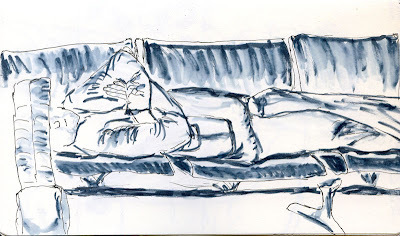 Even flying – the part I enjoy least about travel – offers lethargic, captive models, easy targets for my pen and sketchbook.